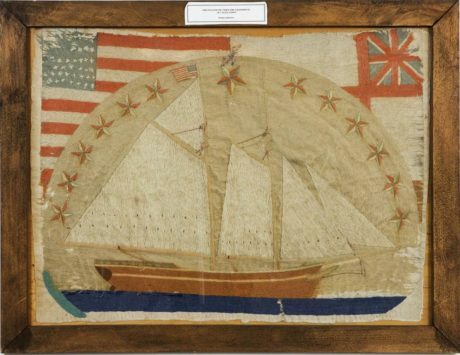 The provenance of this item from the Museum’s collection is a little sketchy, but what is certain is that it is a piece of folk art in a category known as “Sailors Woolworks.” These are commonly called “woolies” or “string pictures.” Sailors Woolworks are relatively rare in the collector’s market today. They were typically designed and stitched by American and British sailors during the years roughly between 1840 and 1915. This particular piece measures 40.5 inches by 31 inches, including the wood frame. A common scene on a “woolie” would include a sailing ship, oftentimes displayed with a flag in the background. 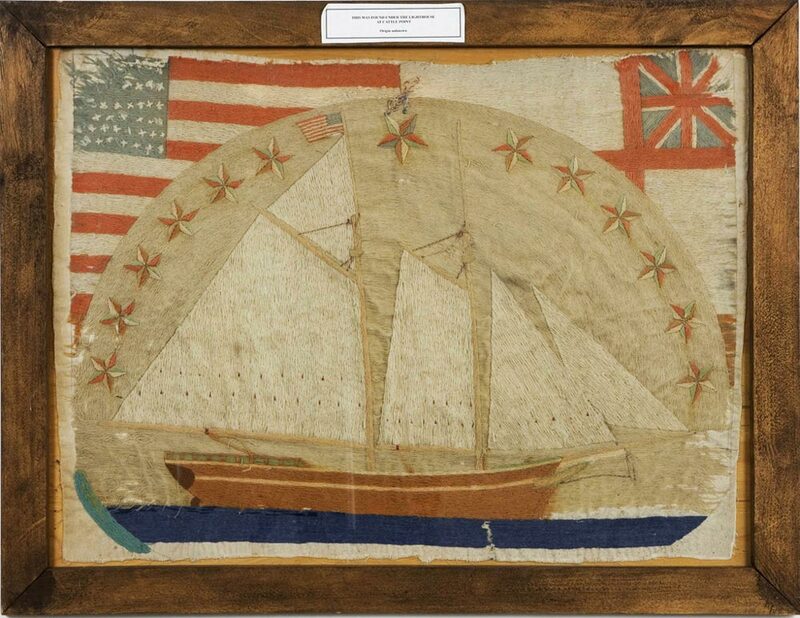 This one features a gaff-headed schooner and two flags — one American and one British. One can assume this is a reference to the Pig War era of our region’s history. An attached label stated that it was found under the lighthouse at Cattle Point on San Juan Island. Although unproven, it does add interest to the story. Since the design includes 13 stars around the ship, the suggestion is that they represent the original 13 colonies and that the piece was created by an American sailor. It’s unfortunate the embroidery is frayed in the upper left corner. If we could count how many stars were stitched on the American flag, we might have more specific clues as to its age. Those reading this who are members of the San Juan Historical Society and Museum may recall seeing this photograph of the “woolie” before, as it was featured in a recent edition of our newsletter. Many interesting articles about local history, as well as the latest news from the Museum, are found in every issue of the newsletter sent to members. Learn about this and other benefits of membership on our website at www.sjmuseum.org. Joining a local historical society is a great way to support historic preservation at a community level. How many stars are in the flag on the mast of the ship? Unfortunately, the tiny stitches on the mast flag are only representative of some stars and do not provide a usable clue, as it turns out. But that was a good question and the SJ Historical Museum appreciates the comment. This woolie is a piece that needs further investigation in the future.